No. 10 & 12, Jalan TPP 5/8, Taman Perindustrian Puchong, 47160 Puchong, Selangor, Malaysia. 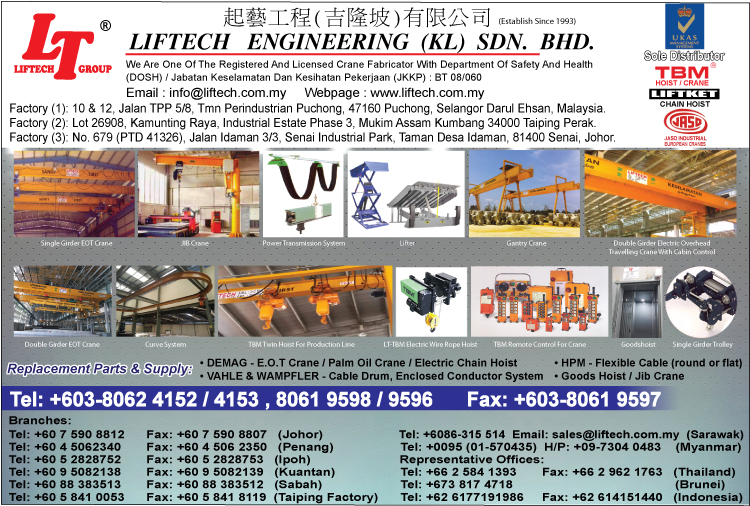 Established in the early 1990’s, we are a group of companies that is involved in the design, manufacture, sales and after-sales parts and services of overhead traveling cranes, palm oil cranes and hoists which is backed by an experienced team that has been in the industry for over 30 years. We provide a full range of sales, parts and services with complete engineering solution to our client throughout Malaysia, Indonesia, Thailand, Brunei, Cambodia, Vietnam and the Middle East. LIFTECH manufacture and supply a comprehensive range of cranes, helping to provide lifting solutions to customers for more than 20 years. We assist customers from the beginning through the end, starting with consultation, design, manufacture & assembly, installation, and inspection & maintenance. We commit to deliver excellence service and quality products through continuously improve all aspect of business operation. We currently have in the group branches in Penang, Ipoh, Johor Baru, Kuantan and Kota Kinabalu with production facility in Kuala Lumpur. We also provide after-sales service and parts to most major brands in the world today catering to all types of industries.